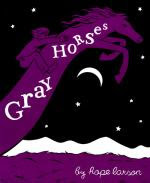 Gray Horses by Hope Larson. Graphic Novel. 2006. Oni Press. My copy. Publisher rates it Teenage 13+. The Plot: Noemie leaves her native France to study abroad. The Good: This graphic novel looks at the experiences of a French exchange student in America; the art and text is deceptively simple. Noemie struggles with loneliness, fitting in, finding friends; and is also having odd dreams about horses. Page one starts with text in French and English; (the publisher has a five page excerpt). The graphics are white and black, against splashes of peach, and often its solely the artwork conveying Noemie's experiences. While there are books about Americans studying abroad, I was intrigued to see here the flip approach. Noemie ponders, "Even the machines here speak another language." But the story is broader than simply someone from another country experiencing America. Going to college can be a strange new land for anyone, even when the language isn't different. Noemie dreams of horses...and what do the dreams have to do with her everyday life? Daily life is meeting a new friend Anna, seeing a strange boy. And it intertwines, with a picture found under her wallpaper being the photo she sees a girl in her dream hide. This is a great book; a quiet look at friendship, of longing, of being away from home, of the layers we find in our life, and of love. I first read this book when it was nominated for the Cybils graphic novel long list in 2006. It's a book that demands to be reread. While there are different ways to think about graphic novels, one of the questions I ask myself is, could it have been told just as well in just text? Does it matter that some of the story is told in pictures? How important is the art? This is one of those books that would not have been the same without the art. Thanks for recommending this; I've now read Salamander Dreams and Gray Horses. They're both really special.